MicroGaming's 243 Ways Slots. Guide to the Latest Online Slots Without Win-Lines, Includes Examples of the Best 243 Ways Games. When you head to any online casino you’ll find a variety of different slots. Many of these slots will have 5 reels and some of the more ‘traditional’ slots might have just three reels. In addition, you’ll also find slots with differing numbers of win lines – the 5 reel slots usually having either 20 or 25 win lines, although 50 win lines also feature widely. MicroGaming, however, offer a range of slots which feature 243 ways to win. In this guide I start by explaining how 243 ways to win slots work. I then look at the big advantage of these slots over others which feature less win lines. Next up I recommend some of the best games you’ll find online featuring this amount of wins. I finish by suggesting an online casino where you’ll be able to enjoy these games. How do 243 Lines Slots Work? Any symbol can appear on any reel in three different ways – either at the top, the middle or the bottom. This means that if there were such a thing a one reel slot, you’d have three ways of hitting any symbol. If you expand this to a 2 reel slot and wanted to pay out on a symbol landing on both reels, there would be nine ways that this could happen – top-top, top-middle, top-bottom, middle-top, middle-middle, middle-bottom, bottom-top, bottom-middle and bottom-bottom. As you can see, you multiply the ways to win by 3 for each reel. If you have a 5 reel slot where every combination is covered, you’d need 3 x 3 x 3 x 3 x 3 ways to win, which equates to 243. This basically means that when you are playing a 243 ways to win slot, every single combination of the reels are covered, and hitting a symbol 3,4 or 5 times from left to right in any position on the reels will guarantee a win. The advantage of playing a 243 win line slot is that knowing whether you have won or not is very clear – if a symbol lands on every reel, you’ll know you are guaranteed the payout for 5 symbols. When playing a slot with fewer win lines, if landing the same symbol on all 5 reels, you’ll be hoping that these actually fall into one of the win lines – but without an exact knowledge of the route of each win line, you’ll be waiting for the slot to tell you if you have won. 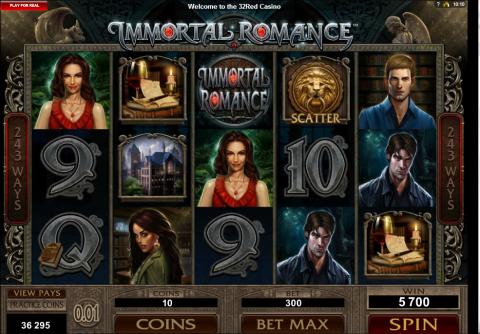 Immortal Romance is an atmospheric, involving slot which follows a storyline based around the four main characters – Amber, Troy, Michael and Sarah. A ‘Wild Desire’ feature will appear randomly, where an entire reel (or more than one reel!) will be turned wild, making for many more wins. However, the best part of the game is the ‘Chamber of Spins’ bonus round. Here you’ll move through each character in the story – moving onto the next every 5th time you land the feature. Each character will offer a different take on a free spins round – with varied amounts of spins, multipliers and wilds. Read the full review of this popular game here. The Jurassic Park slot is one where the symbols are floating and not attached to reels, which makes for an original look to the slot. The game has two distinct features. 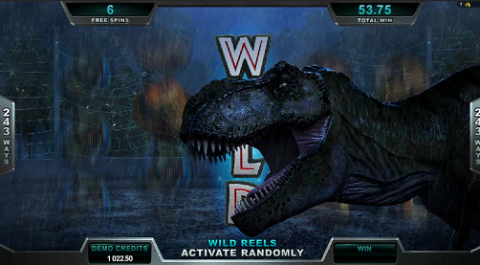 Firstly, there is the ‘T Rex alert’ feature, where the famed dinosaur will appear randomly – your next 6 spins will feature an additional 35 wilds on the reels, these wilds being stacked. Landing the ‘Fossil’ scatter symbol will activate the free spins feature – with 5 different free spins round, each one named after a different dinosaur. You’ll have varied multipliers, wilds and numbers of free spins dependent on which round you play (this will be your choice if playing the free spins rounds on more than 25 occasions). Read the full review of Jurassic Park here. The Game of Thrones slot is a very crisp looking one with a highly polished feel. 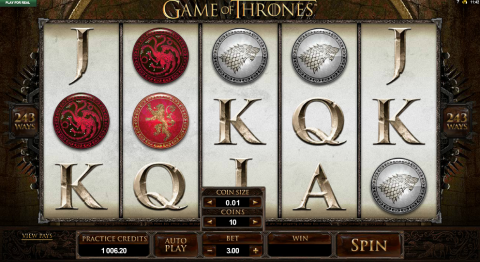 The game features a scatter symbol which activates one of the four free spins bonus rounds – Baratheon, Lannister, Stark and Targaryen, each of which offers varied number of spins, stack symbols and multipliers. You’ll also find a ‘Gamble Trail’ feature, where you’ll choose heads or tails which could double your win and move you on to another section of the game map. Read the full review of Game of Thrones here. You’ll find a wide range of these ‘243 ways to win’ slots at the award winning 32 Red casino. Alongside these games you’ll find the big progressive jackpot slots from MicroGaming, plus 100's of other titles. When you join 32 Red casino, you’ll be given £10 free as a no deposit bonus, as well as being able to take advantage of a £32 bonus for every £20 you deposit to the site. Check out the new generation of 243-way slots over at www.32red.com now!